Happy Holidays, friends! 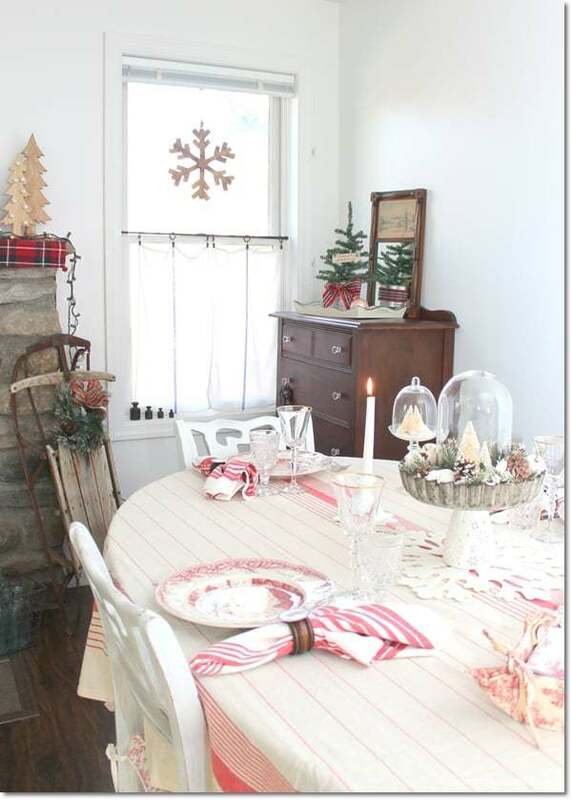 In the last few days, I have enjoyed looking at farmhouse Christmas home tours on different blogs, and I thought I’d share my favorite ones with you! I mean, is there anything better than a farmhouse all decked out for Christmas? 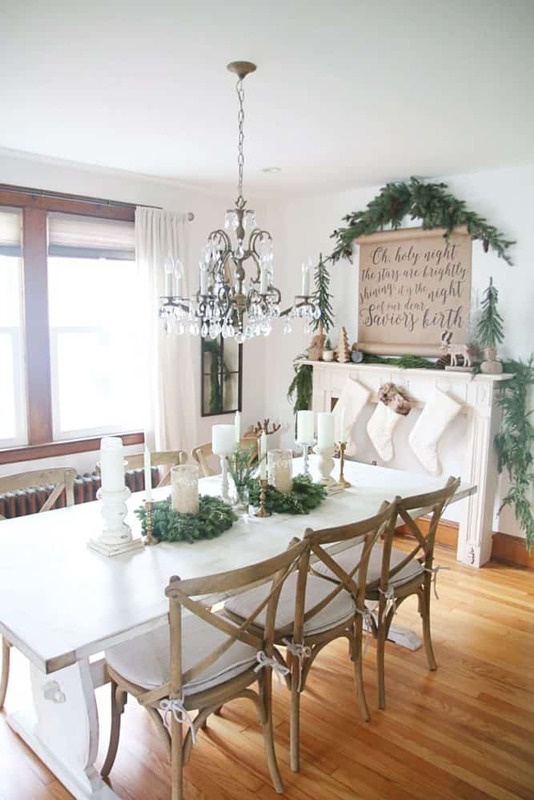 Or a home that’s all decked out with farmhouse decor? 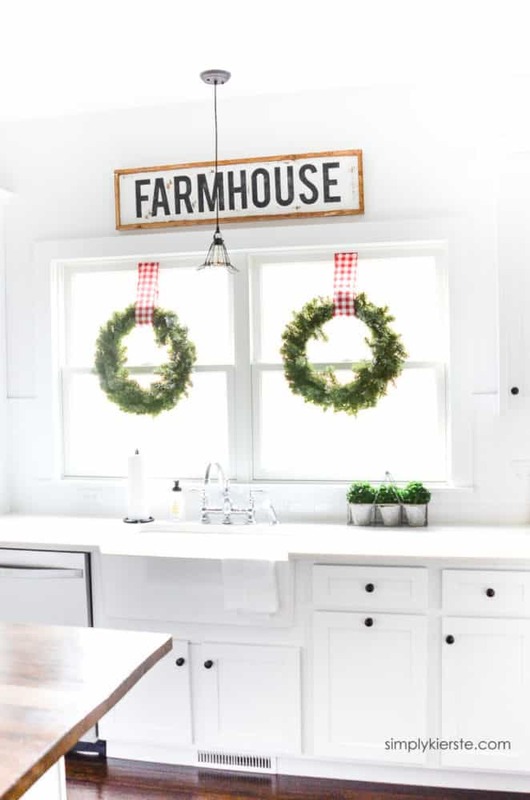 We don’t live in a true farmhouse, we live in a small home I lovingly call Blue Cottage, because to me a cottage is just like small farmhouse if it’s decorated with farmhouse decor. 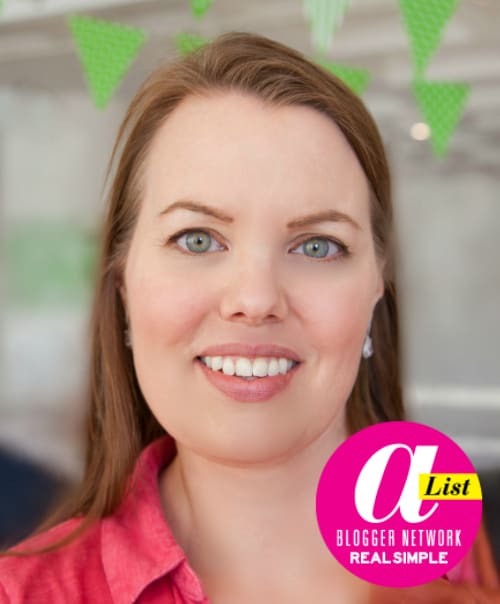 I’ve noticed that a lot of the bloggers use a minimal approach — their home tours are beautiful with a minimum of decor. 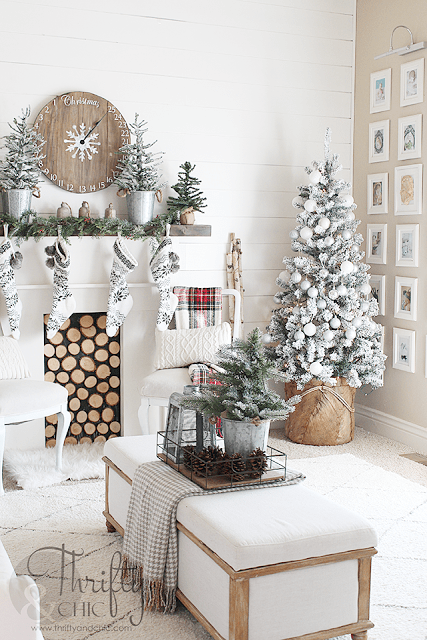 I have a tendency to want to use all of my decorations, and I have a ton for Christmas as you can see in my home tour from 2017, but I’m totally inspired by the more minimalistic approach of other bloggers. It just shows you once again that you don’t need to have loads of expensive decor to have a beautiful home. 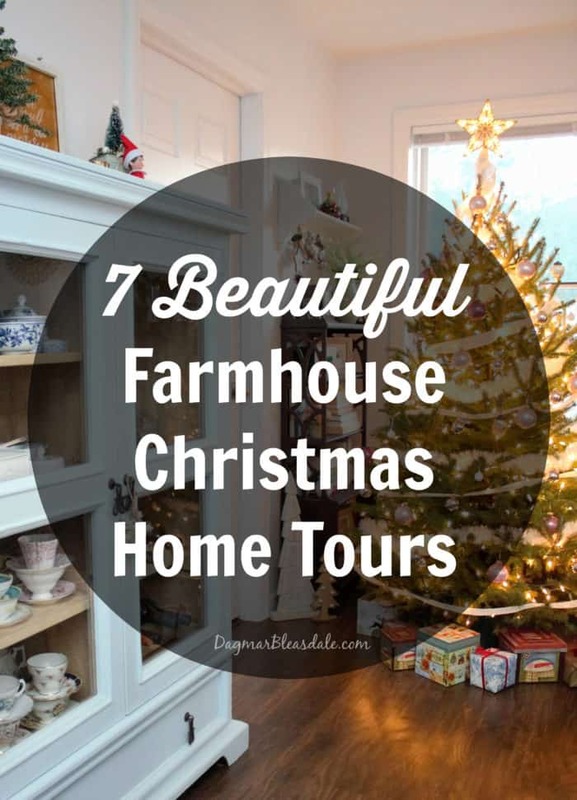 I hope you will enjoy these Farmhouse Christmas Home Tours as much as I did! 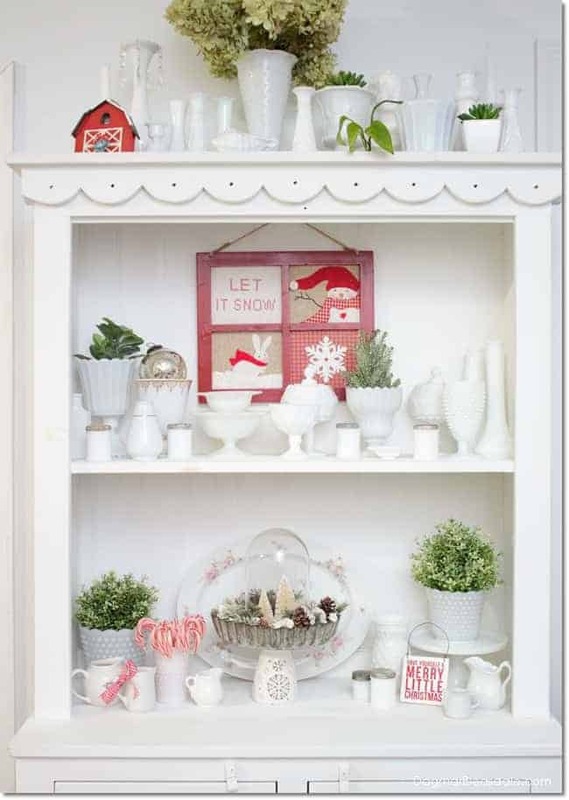 If you’ve seen our hutch filled with my milk glass collection, you know why I love this hutch full of white dishes. And I have the same vintage picnic basket. Here is lovely simplicity with just some greenery = perfection. Okay, how genius is this “advent calendar clock”? 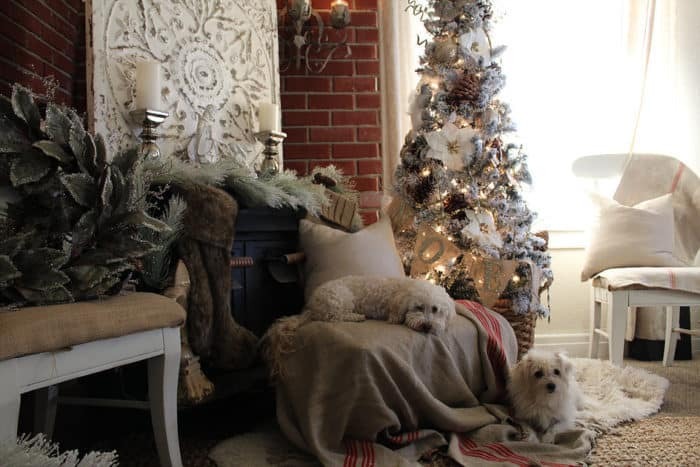 And now I want to recreated this wood look for our fireplace. I love this tall baker’s rack-style shelf — it reminds me of the rustic console table I added to our kitchen. More space for decorating, which I can never have enough of. 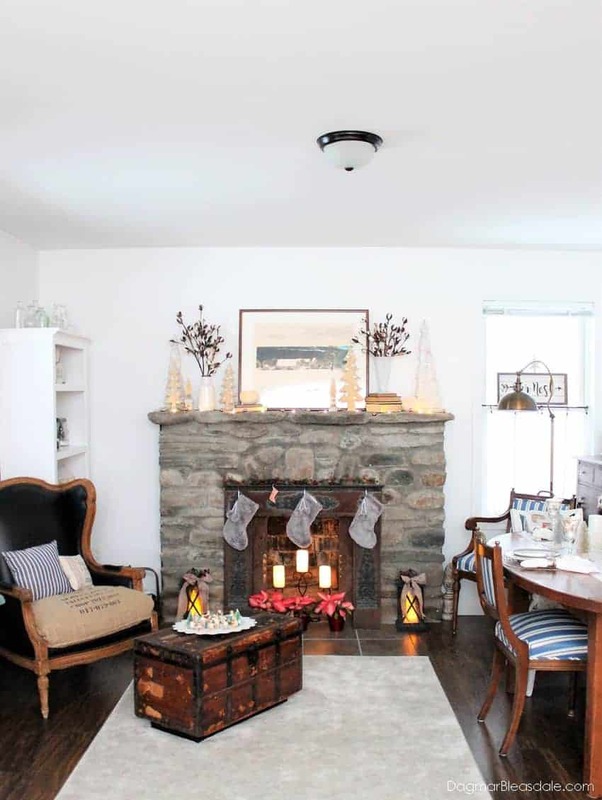 My friend Sandra came up with this pretty idea for wall decor, and I like that she created a faux fireplace by just adding a mantle in her dining room. I love the simple banners on this Christmas tree. And the shiplap. And the sconces. And that window seat. 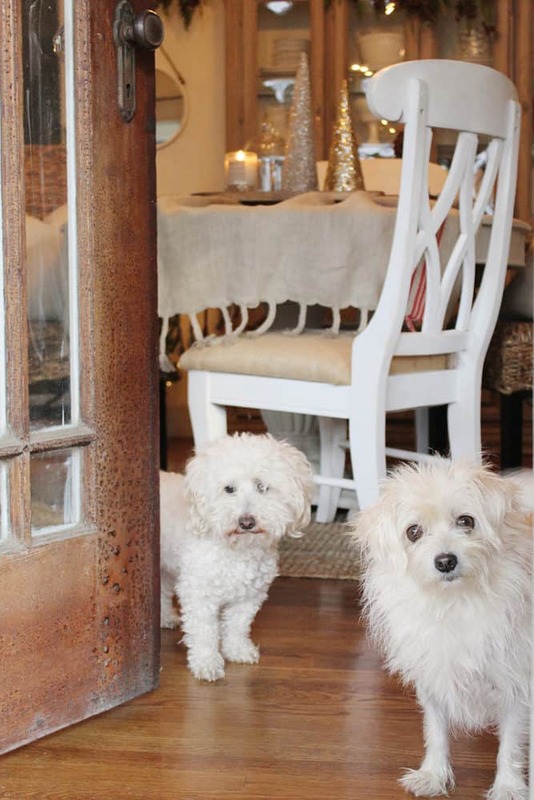 These sweet dogs are the highlight of this farmhouse Christmas home tour, but there is so much more you’ll enjoy. I almost bought a similar distressed tin ceiling tile at the Country Living Fair this year, but I had to rush back home to get Landon off the school bus and totally forgot to go back for it. I mean, how cute are they? 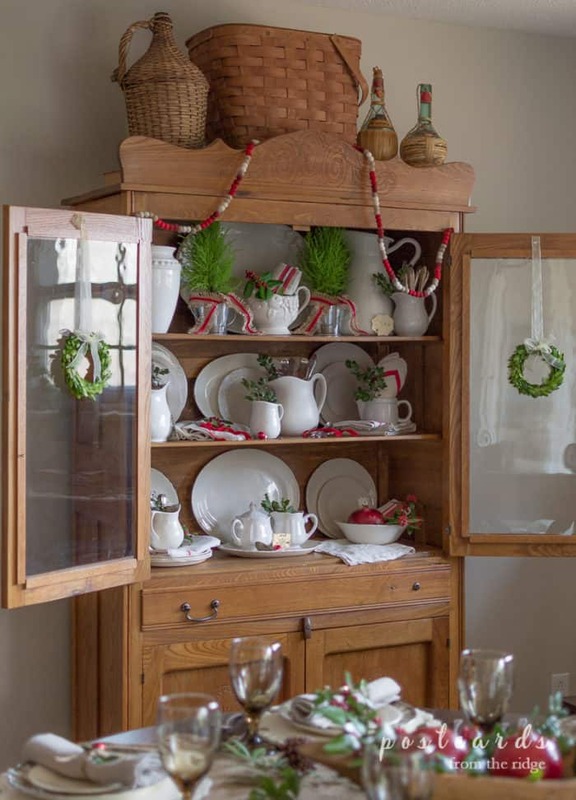 Find many more farmhouse Christmas decor ideas on this Pinterest board! 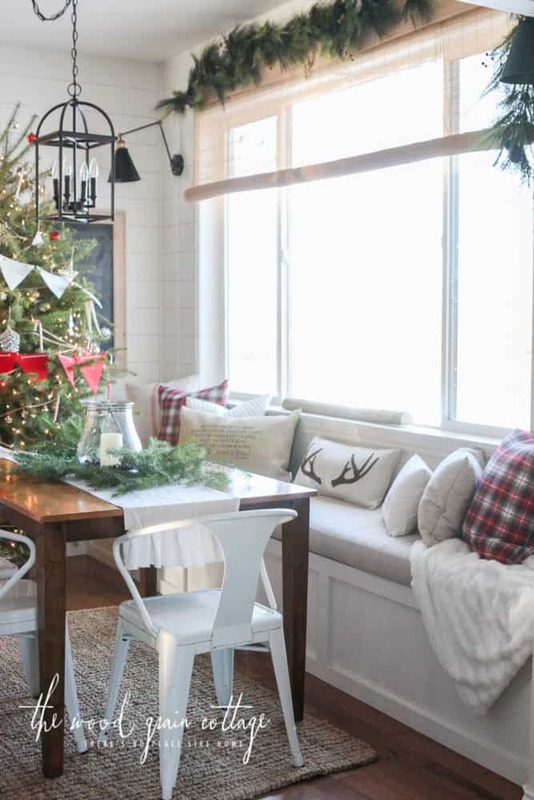 Which one is your favorite farmhouse Christmas home tour? It’s a good thing Christmas comes around or else these homes would have NO color in them. They are white on white on white on white. No color, no imagination. 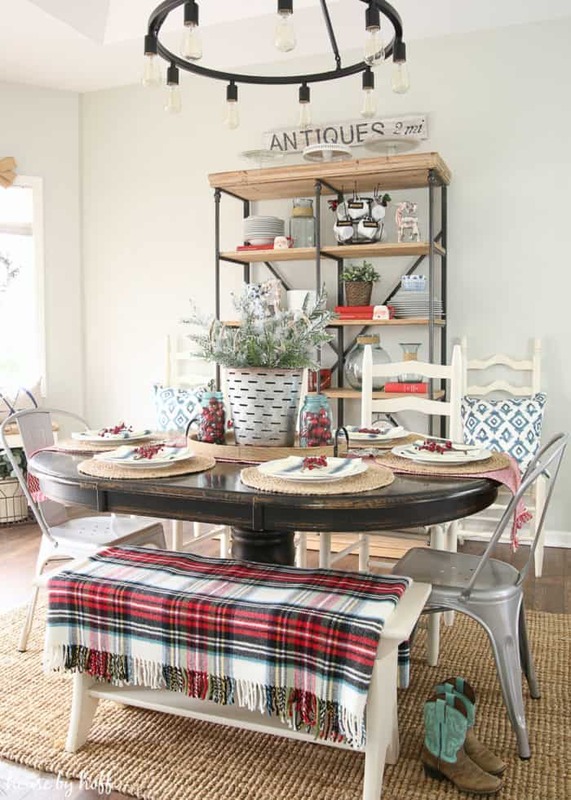 Thank you for sharing these beautifully decorated farmhouses at share your style! These farmhousesare outstanding. 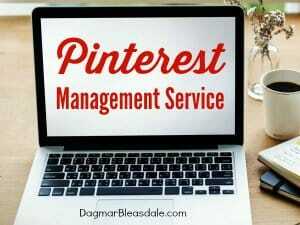 Love them all and so many great ideas. Thanks for sharing. Thanks, Trisha, I’m glad you love them!